White Dwarf has always been a magazine near and dear to my heart. When I first started in the hobby, it was a source of inspiration – beautiful figures, exciting battle reports, basically a window into what the game could be. And on a limited budget, an issue was also the perfect impulse purchase. And when I moved to a place where it was sold on the shelves of ordinary bookstores…well, it drew me back into the game. “Huh, White Dwarf, haven’t read that in awhile…” turned into finding my local store and purchasing a new army. So when they announced the latest redesign? I picked up a subscription. Frankly, I’m not sure I see it. Looking back on old issues I have, while there are definitely ebbs and flows, White Dwarf has been broadly similar for a long time now, certainly since it stopped being a general hobby magazine. Always a little bit advertising heavy, sometimes with some great features, sometimes not. The exception has been this most recent iteration of White Dwarf, where they split the content into the weekly mini-magazine and the Visions “coffee table book”. I didn’t really understand the logic behind that. The weekly magazine was only available in stores, and even if you do have a FLGS a weekly schedule can be pretty unrelenting. And Visions was wholly disappointing, especially as many of the pictures could be seen elsewhere, and the text captions were actually 1/3rd as large as they seemed to be because they were printed in multiple languages. 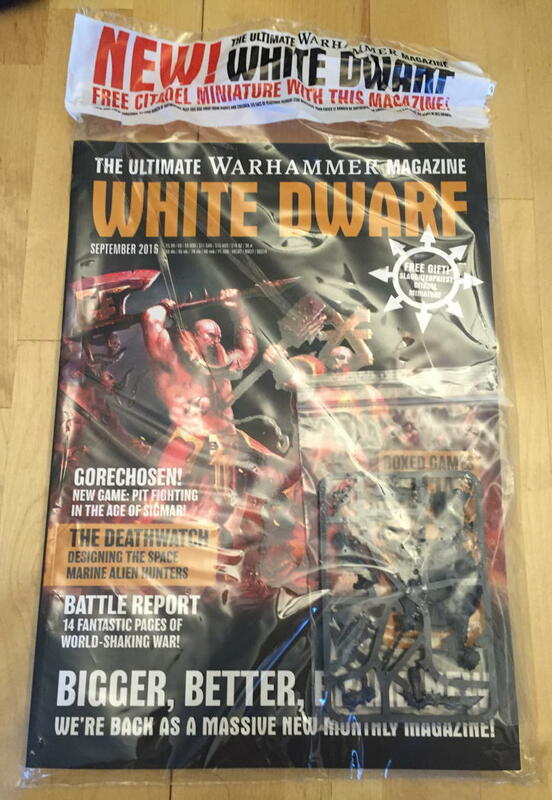 Apparently the market agrees, because White Dwarf has undergone another change. So how is it? 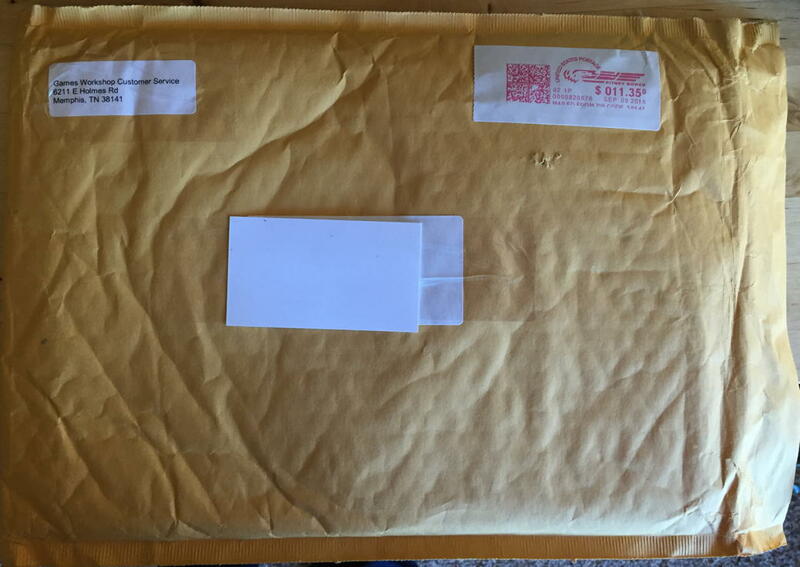 As Princess Irulan says, “The Beginning is a very delicate time.” And for U.S. readers, the magazine is off to a rocky start, with some serious shipping delays. My copy came in a tattered, plain padded envelope, the kind I usually associate with bits orders I’ve picked up off Ebay. Credit where credit is due however, Games Workshop must be bleeding money sending out replacement copies, etc. But their customer service has always been spot on. So when not presented in a tattered envelop, how does the magazine look? The new White Dwarf is…well…it’s quality. The free miniature aside, it’s printed on nice, heavy and high quality paper with the same matte surface with gloss details of some of their other print products. Sized on A4 paper, it’s slightly larger than a standard U.S. magazine, making browsing the magazine a little more difficult. The 148-page size doesn’t help with that. It’s a magazine meant to be engaged with, rather than flipped through. But how’s the actual content? Well, this is the first episode, and as mentioned, it’s 148 pages long. There’s a lot of content. The beginning is the “Latest News” section, which is a familiar friend – a feature of the new stuff put out by Games Workshop. Importantly, they’ve expanded beyond that as well, covering Black Library, video games, etc. There are some expanded features for some new products that go beyond just a picture and pricing – like a one-page feature on the Deathwatch Kill Team or the new Corvus Blackstar. This is the section that feeds the notion that White Dwarf is an advertising circular. And while it’s definitely there…it’s only about 20 pages long for the entirety of Warhammer and Warhammer-related things. And it is the official magazine of a game company – there’s going to be some product features. That’s just going to happen. So what about non-advertising content? There’s a lot of it. Heavy Metal spotlights, two-page spreads for basically every mini-game or boxed set GW has released recently, a rebooted Tale of Four Wargamers, an Age of Sigmar Battle Report…the list goes on. The highlight, for me, was an article and several page photo spread on a gorgeous Eldar army. If we can expect something like that every month, we’ll have collections to envy for some time. The rules sections are useful, but not particularly imaginative. Like the new Kill Team rules they’re things you could think up yourself, but it’s nice to have them presented for you. The magazine is just page after page of small features like this. Which means while it’s rich in content, it also ends up feeling somewhat frenetic. Like an unfocused child in a toy store, who wants to show you everything, but only gets halfway through explaining how cool something is before their eye is drawn elsewhere. It’s all good stuff…but it feels packed and busy. There’s glimmers of more in-depth articles there, but we’re not really seeing them yet. I’d call myself cautiously optimistic. They seem to be wanting to make a go of revitalizing White Dwarf, returning it to the halcyon era of whatever everyone remembers as their favorite version (my personal theory is its whatever version existed when you started reading). They’re clearly aiming for a rich amount of content, but right now it’s still very much “small bites of GW games” – just a lot more of them. I’ve got hope that they’ll be doing more in-depth material in issues to come. It also remains to be seen if this level of content can be maintained, or if this is just working through a queue of material they had for the weekly magazine. A question that I’ll revisit in the new year, once that initial surge of enthusiasm has worn down. Overall? I’d give it a 7.5/10. A promising start, but there’s still a lot to be done to revitalize White Dwarf.